When the uniqueness of Super Bowl week marketing gets kicked up even higher with a freak weather event, the result — however interesting it might be — just isn’t going to apply to many other real-world marketing situations. But when that freak weather event is affecting a huge swath of the rest of the United States, and local marketers are jumping in with real-time campaigns and CRM activities such as sending messages about new store and office hours in reaction to the event, that’s something any marketer can relate to and maybe gain some insight from to use for future real-time marketing opportunities. With that in mind, this post is “plan B” — some crowdsourced, real-time reporting on various marketing efforts taken in response to Snowmageddon. Leyla Arsan of Lotus Marketing Services offered this interesting restaurant promotion: One of my clients, a 20,000-square-foot restaurant in Chicago, offered a blizzard promotion. For each inch of snowfall, they offered guests that percentage off their check. For example, 20 inches = 20% off your total bill. On Wednesday night, they had over 100 guests with only a few hours to promote the special. They used email marketing, Facebook, Twitter and Foursquare to promote the special. The Boston-based B.Good restaurant chain posted a humorous photo to their Facebook page featuring a giant snowman built at one of the locations while staff awaited customers. The photo was posted on a day when the area received more than a foot of snow. “The photo generated great buzz with ‘Likes’ on our Facebook page, and encouraged walk-ins when we ordinarily would have seen few, if any,” said Jon Olinto, Co-founder B.Good. I am going to promote the heck out of the videos and also offer a Snowmageddon special through my newsletter and through social media sites. Rick Delashmit of FruitMyCube.com in Belleville, Illinois: We had to delay some of our scheduled FruitMyCube deliveries this week due to the weather. We notified several hundred customers of the order delay/cancellation with this email. Then today (Wednesday), as we opened up ordering for next week, we announced that we would be including one of our hand-dipped Chocolate Covered Strawberries in each Cube as a thank you for their patience through the “Snowpocalypse”. Then come Valentine’s week, we’ll tie all this together by allowing our customers to add a Gift Box of the berries to their FruitMyCube order. Here’s the email that announced the free chocolate covered strawberry. Jenny Vance, President LeadJen: As an outsourced Lead generation company, LeadJen is conscious about using client billable time when we will see the highest connections and also highest conversions. Typically, those two things have a 1:1 relationship. If you have more connections/conversations, you have more conversions. However, we have found that a winter event is much like the holidays because while the ability to connect is greatly reduced, the quality of the connections is much higher. This is because we have an easy way to personalize the message and a universal conversation topic—weather! The people that are in the office are also not as inundated with requests and interruptions, so the cold call is less of a bother. In order to maximize the conversation topic, we include reference to weather in our voicemails, live dialogues and also email content. We’ve found that it greatly improves our inbound response to those messages. At the end of the day, we estimate that instead of a 1:1 relationship between connections to conversions, we see a 1:2 relationship. It so critical that during winter emergencies that have the potential to cripple results, LeadJen has been able to stabilize and sometimes improve project performance. All marketers know to tailor campaigns and offers to events like Valentine’s Day or St. Patrick’s Day, but the nimble marketer will also react to events such as weather or breaking news to take advantage of publicity and promotional opportunities. It doesn’t have to be a freak snowstorm rampaging across most of the country, although there’s a lot to work with, as seen above, to get into the world of real-time marketing. You just have to find the opportunity in the news, events, announcements — and yes, even weather — that happen every day. It’s great to see companies respond to real-time situations (like the seemingly endless supply of snow this winter) with humor, grace and creative promotions. Using what would normally be a slow time to reach out to your consumers and remind them “we’re with you in this” encourages goodwill, draws attention and (as shown by some of those listed above) can even increase sales. Bravo! Some nice real time marketing examples here. But how about getting pre-real time? Some external real-time events can be expected to happen, just not the timing. Freak weather will strike sometime. 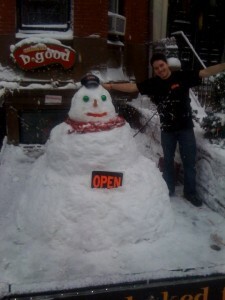 Here is an example of using snow weather last year for an email campaign http://dmaemailblog.com/2010/11/30/using-external-events-for-email-relevance/. This can be mostly prepared in advance just waiting for the event to happen. Television news shows do this too, they keep obituaries at the ready and constantly updated for famous public people. So should should the sad event of a passing happen, the story is ready to roll. As for the Super Bowl, there are a limited number of outcomes, so get pre-real time ready for all of them. Of course many events are so freak then true real time thinking and speed is needed. But when you can, be prepared.